The three-door Up! Lite boasts a 70 mpg, two-cylinder diesel engine, a 10 kilowatt electric motor and a carbon-fiber roof. 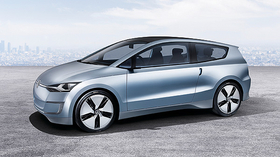 LOS ANGELES -- Volkswagen of America will introduce an electric version of its upcoming Up! hatchback in 2014 in the United States. In a world debut, VW today unveiled a four-seat concept version, called the Up! Lite, at the Los Angeles Auto Show. The three-door car boasts a 70 mpg, two-cylinder diesel engine, a 10 kilowatt electric motor and a carbon-fiber roof. The Up! Lite weighs 695 kilograms, which is about 1,530 pounds. To compare, a Hyundai Accent weighs 2,467 pounds. The Up! hatchback, which will not sell in the United States, reaches Europe at the end of 2011. The Up! line also includes a minivan and a sedan that go on sale in 2011 in Europe. Also at the auto show, VW of America President Stefan Jacoby said a new-generation Beetle that will come to the United States as a 2012 model will contain a clean-diesel engine. Jacoby said the Volkswagen brand continues to add diesel engine options. A new mid-sized sedan that will be built in Chattanooga, Tenn., in 2011 will also contain a clean-diesel engine.